Fashion retailer H&M is building a new 1MW data center in Stockholm, and feeding its waste heat into the city’s district heating system. The data center will open in Stockholm Data Parks in 2018, and will connect to the heat reuse system run by Fortum Värme, which has been providing district heating in Stockholm for several years. The 1MW of heat it will produce is enough to warm around 2.500 modern apartments, says H&M. The solution chosen by H&M uses heat pumps in an N+1 configuration. Excess energy is fed directly from the data center to the district heating network at the required temperature. H&M is consolidating its data centers in Sweden, where it opened its first data center in 2010. 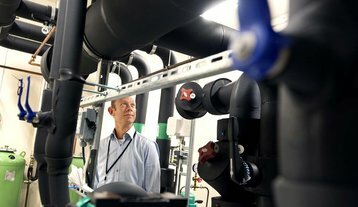 That facility uses a liquid cooling system, which was extended in 2013, so it could feed heat into the district heating system through a heat exchanger. This connection also boosts the cooling system for the data center, as it can provide cooling on hot days. Around 90 percent of buildings are connected to the district heating network in Stockholm, which is one of the few world cities wher large scale heat reuse is possible. H&M has also taken part in other green initiatives, such as a drive to collect used clothes. In 2014, the company launched a range of clothes made from recycled garments.